Lifting off under sunny skies, the Soyuz launcher for Arianespace Flight VS17 begins its mission to deploy SES-15 at the service of European-based SES. 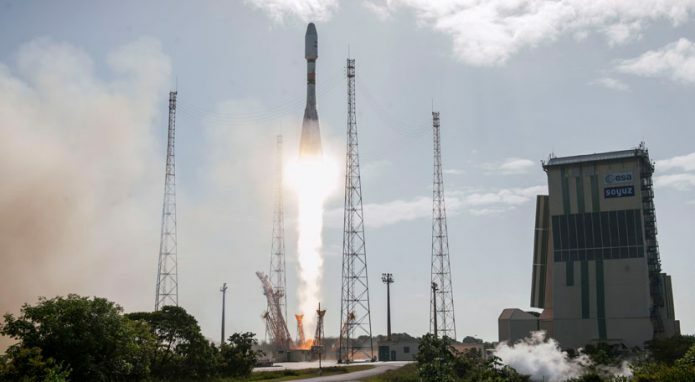 With a picture-perfect liftoff from the Spaceport in French Guiana this morning, Arianespace’s workhorse Soyuz launch vehicle successfully delivered SES-15 – an all-electric telecommunications satellite for operation by European-based SES – to a geostationary transfer orbit. Arianespace’s medium-lift workhorse vehicle climbs away from French Guiana on its 17th Spaceport mission, carrying the Boeing-built SES-15 satellite for SES. The flight, designated VS17 in Arianespace’s launcher family numbering system, lasted 5 hrs., 18 min. from the precise liftoff at 08:54:53 a.m. (local time in French Guiana) to payload separation. 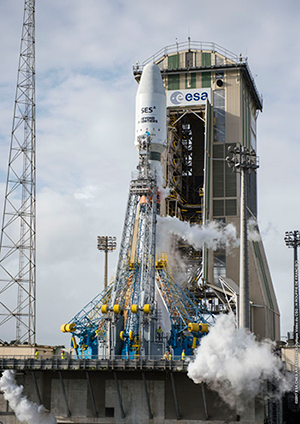 It carried SES’ first satellite lofted by the medium-lift Soyuz launcher and the 40th overall for the operator launched by Arianespace. Departing from the Spaceport’s ELS launch complex adjacent to the commune of Sinnamary, Flight VS17 lifted off with a total payload mass of 2,447 kg; it was Arianespace’s fifth mission of 2017 and the Russian-built Soyuz’ 17th liftoff from French Guiana since this vehicle’s 2011 introduction at the Spaceport. – Apogee: 31,348.9 km. for a target of 31,299.6 km. – Perigee: 2,207 km. for a target of 2,198.8 km. – Inclination: 5.99 deg. for a target of 6.00 deg. Luce Fabreguettes, Arianespace’s Executive Vice President Missions, Operations & Purchasing, underscored Arianespace’s relationship with SES stretching back to 1984. 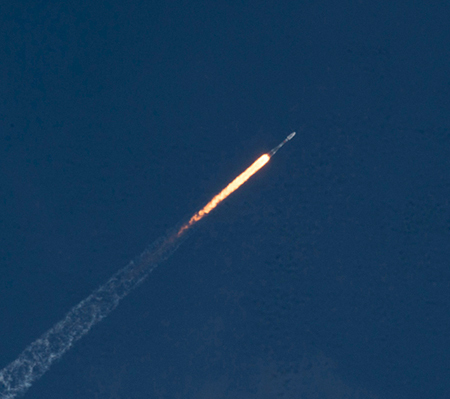 She noted that more than 40 percent of the SES geostationary satellites currently in operation have been orbited by the launch services company – a number that does not include the O3b Networks satellites launched by Arianespace into medium Earth orbit. Fabreguettes pointed out that Arianespace has five more SES satellites in the company’s launch services backlog – including another electric satellite, SES-12 –– along with four additional O3b spacecraft. Delivered into a geostationary transfer orbit by Soyuz, the telecom satellite will achieve its final position under the power of an all-electrical propulsion system –SES’s first satellite to use such technology. 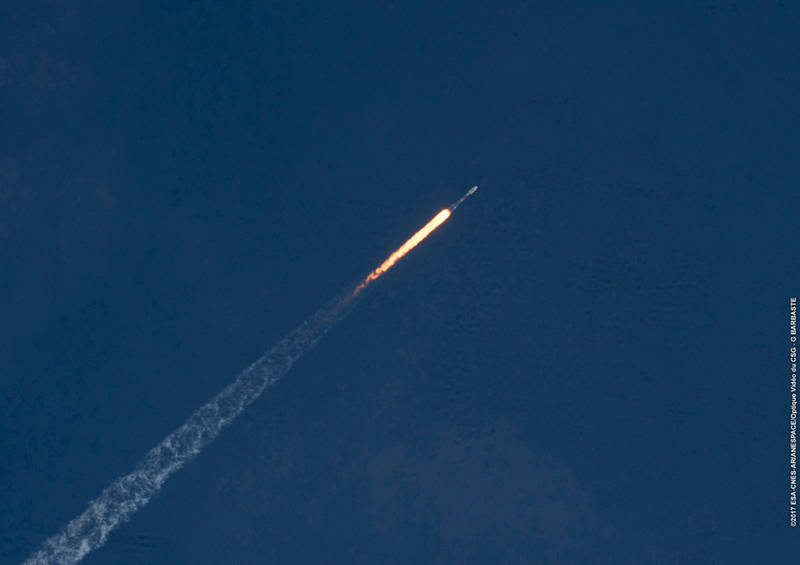 Martin Halliwell, the Chief Technology Officer at SES, described today’s mission as a “fantastic launch,” and confirmed that initial telemetry was received from SES-15 shortly after its separation from Soyuz. Once located at 129 deg. West, SES-15 will serve as SES’ first hybrid satellite, offering a mix of wide-beam coverage and High Throughput Satellite (HTS) capacity. The coverage area extends over North America, Mexico and Central America, stretching from Arctic Alaska to the south of Panama and from Hawaii to the Caribbean. Arianespace Flight VS17 marked the first time a Soyuz was utilized to orbit an SES satellite, as well as a spacecraft built by Boeing. The Russian-built vehicle is shown on the Spaceport’s ELS launch pad. It is to provide Ku‐band wide beam and Ku‐band HTS capability, with connectivity to gateways in Ka‐band. Its relay payload covers the thriving aeronautical sector and will enable other traffic‐intensive data applications for government, VSAT (very small aperture terminal) networks and the maritime sector. SES-15 also carries a Wide Area Augmentation System‐hosted (WAAS) payload, enabling the U.S. Federal Aviation Administration to augment the Global Positioning System (GPS), providing improving accuracy, integrity and availability for the aviation industry. Built by Boeing at its El Segundo, California facility, SES‐15 had an estimated liftoff mass of 2,302 kg. and is based on the company’s all‐electric 702SP platform – marking the 53rd Boeing‐built satellite to be launched by Arianespace. Speaking at the Spaceport, Mark Spiwak, the President of Boeing Satellite Systems International, described his company’s relationship with Arianespace as a “very deep, rich and valued” history. “Today was our first launch with Soyuz, and we are looking forward to developing an equally long relationship with Soyuz as we go forward,” he added. Elsewhere at the Spaceport, preparations are being made for Arianespace’s next heavy-lift missions as the company continues with its goal of performing 12 launches during 2017. These two missions – designated Flights VA237 and VA238 – will be the 237th and 238th performed by Ariane launchers since the family of European-built vehicles began Spaceport operations in 1979. Flight VA237’s Ariane 5 launcher has moved from the Launcher Integration Building to the Final Assembly Building, where a dual payload of the Viasat-2 and Eutelsat E172B telecommunications satellites will be integrated. Liftoff of VA237 is set for June 1. The subsequent Ariane 5 launch, Flight VA238, also will deliver two satellites: the Hellas-Sat 3/Inmarsat S relay satellite; and the GSAT-17 telecommunications spacecraft for the Indian Space Research Organisation.